For week 3 of VLV, Amy Sheffer provided us with this great sketch. 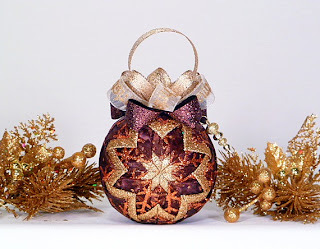 I again went looking for holiday decor inspiration on Etsy, and found this quilted ornament. It was made by CreationsByAngel. She had them in lots of different color combos, but my favorite was this burgundy and gold one. I wish that I had the budget to buy a whole bunch of them! How gorgeous would a tree be covered in lights and these quilted ball ornaments?! I used a black base, then a brown wide mat, and then a narrow black mat. The two dp are from The Paper Studio's "Faith" stack. I used some black satin ribbon and tied it with my Bow Easy. 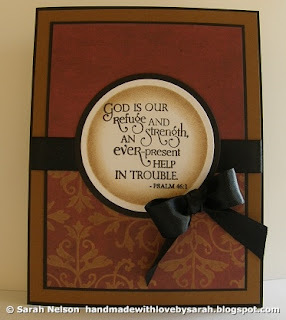 I used a Verve Plain Jane stamp called "Psalm 46:1." I stamped the verse using Versafine Onyx Black, cut it out with Nesties, and sponged around the edges mostly in Vintage Photo Distress Ink with just a bit of Walnut Stain DI at the outer border to try and give it a "glowing center" as in the ornament. Very nice job with the sketch! love the colors, the patterned paper and the lovely Psalm. The sponging looks lovely!